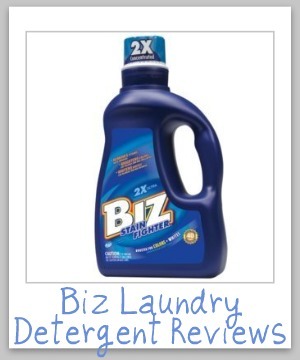 Find out information and read reviews about Biz laundry detergent and stain remover, and also share your ratings and reviews of this laundry product here. This is where you can share your "Mom reviews" of this laundry product, telling whether you would recommend it or not. In addition, if you are considering buying it, find out what other "Mom reviewers" and other people have said about it here. Further, this is one of my favorite all time presoakers since it gets out a variety of stains. Check the link for more information about the wonders of presoaking stains! Biz And Oxiclean Make A Presoak Miracle Worker! It's The Best Whitener Ever! My Partner In Removing Stains! It Shares The Workload With You! Biz isn't actually a laundry detergent at all, but instead is actually a laundry stain remover and presoaker that is designed to act as a booster to your normal detergent. It contains "stain fighting enzymes" plus oxygen bleach which, the advertising says, helps it to act on many types of stains. As you can see from the reviews already provided, many people do recommend this product as one of their favorite laundry stain removers. In addition, I've included it in my recommended stain removers. It can be used with either HE or non-HE washing machines. It comes in three different varities, liquid, powder and the newest, Biz Blast Packs, which are a stain removing pac. It is also added as an additive to certain versions of Oxydol laundry detergent, at least according to a couple of readers. I would love to hear your reviews of this product below. As always, I am especially interested in how it worked for you with various stains you encountered while using it. Along with the many laundry uses for this product, please also note that the powder version can also be used for cleaning many types of sufaces in your home as well. You can purchase Biz in many stores. In addition, here is some information about where to find Biz for sale online.